At the time of this post, if you do a Google "News" search for the sentence underlined, you will find it only at the VOA source. The article notes that Gates made the statement, "to reporters on his aircraft during a domestic trip on Wednesday." Apparently, it wasn't newsworthy except to the official news agency for the United States government. President Obama's withdrawal promise has been treated with some skepticism. Now we've got Robert Gates adding a cynical codicil: "if they want to talk " we're obviously open to discussion." We're used to some military officials challenging President Obama's authority. Both General David Petraeus and former Afghanistan commander General Stanley McChrystal have contradicted Obama. But now we have the Secretary of Defense encouraging the Iraqi government to speak up if they want us to stay. He's giving that government leverage to force a discussion of a set policy at a critical juncture. One has to wonder where Gates gets the confidence that Congress would approve another year or ten simply because the Iraqis government asked. The Voice of America charter states that, "The long-range interests of the United States are served by communicating directly with the peoples of the world by radio." VOA How well did it do its job in this article? The narrative presented the troop withdrawal as being on time but then raised questions about the wisdom of the overall policy and the removal of all US troops by the end of 2011. VOA quoted Iraqi Lieutenant General Babakir Zebari and alluded to a larger unnamed group as questioning the 2011 deadline. At that point, the article brought in "Iraqi expert" Michael O'Hanlon of the Brookings Institution, a DC think tank supposedly aligned with the Democratic Party. 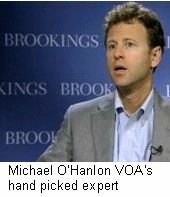 Part of O'Hanlon's expert credentials were earned as an early supporter of the invasion planning by former Secretary of Defense Donald Rumsfeld. The Iraqi "expert" of choice said that General Zebari's views were probably those of most Iraqi commanders. Then he offered this endorsement of an ongoing occupation. It was time for VOA's message to the world, Gate's offer to change the withdrawal deadline. There was no mention of competing arguments including the stated policy of the US government. There was certainly no rebuttal offered for the absurd statement in O'Hanlon's set up about the U.S. as "this good friend of the Iraqi people. Can he read? And there was not a mention that the Iraqi people have consistently favored a U.S. withdrawal in six to twelve months for years.